Have you guys seen the banana granola bread trending on Instagram lately? It’s quite a thing.. So many have jumped on the band wagon of combining timeless breakfast comfort foods. I had seen so many photos and posts and made a few recipes from other bloggers which I didn’t love. So when Graceland Fruit (the dried fruit experts since 1973) asked me to make a recipe for them using their new amazing NO sugar added cranberries which I love, I was beyond excited! Of course I had so many ideas and endless applications! I suggested this breakfast banana bread and they loved the idea. I am so happy that we now have whole soft no sugar added cranberries. I literally have dreamed about this since 2001 when I first discovered Graceland Fruit via Maricu in Mexico City. My first healthy recipes always incorporated dried fruit and back then the only options available had added sugars. Having hypoglycemia means I really try to limit added sugars. So I am thrilled that we now have an option and stay tuned because more no added sugar fruits are coming and they also have a line of organic dried fruits! To buy these fruits check out their website. So after making MULTIPLE banana breads in my life .. I am sure you have also, I pulled my best #paleo banana bread and adapted it to add Graceland Fruit cranberries and also made another version because why not? A good recipe always leads to another great recipe! This banana bread is moist, not too sweet, and most of all the texture is really spongy and light, you would never guess it’s: paleo which by definition means: gluten free, grain free, dairy free and also low in natural sweeteners. I love this recipe because you can make: muffins, donuts, cakes and even savarins. This is a sponsored blog post and all opinions are my own. Thank you all for supporting the brands I love! Huge thanks to Graceland Fruit for featuring my story on their side kick profile! 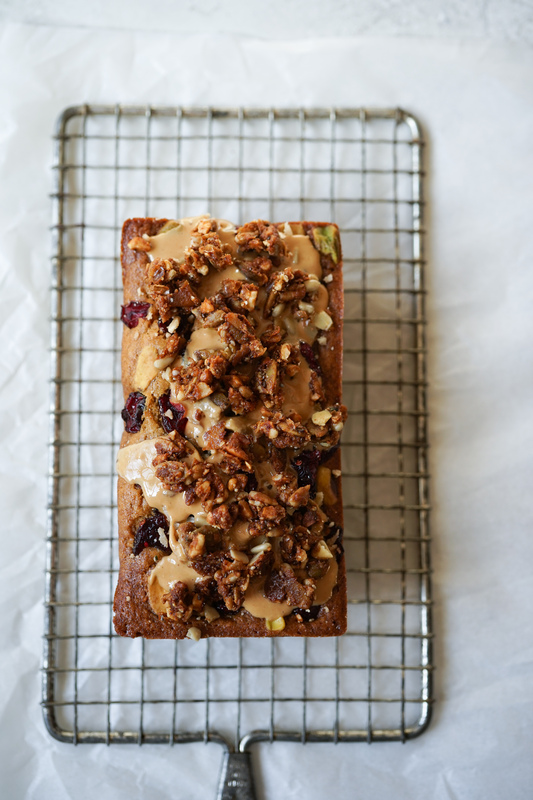 My go to #paleo banana bread with granola. So simple and a total crowd pleaser. I have made it many times for events, networking and people love it! Pre heat oven to 350 F, grease and line a large loaf pan (or 3 small loaf pans) with paper. In a large bowl: whisk all the wet ingredients: banana, oil, maple syrup, Stir sweetener mix with a whisk. In another bowl: sift all the dry ingredients: flours, salt and baking soda. Add to wet ingredients and add half of the cranberries, use a plastic spatula to finish mixing. Pour batter into prepared pan. Sprinkle the rest of the cranberries and pistachios on top. Bake for aprox 45 mins (for large pans) or about 20 mins for mini loaf pans or until a toothpick comes out clean. You may need to lower the baking temperature to 340 F so it doesn’t over brown. Let cool, unmold. Cool completely. Glaze with cashew butter, and top with the granola. Hi Gabriela there is only one! Arrowroot starch. I use Bobs Red Mill. I am vegan and want to try this bread. Can I substitute flax eggs and still have a successful product? Thanks for asking. I would suggest you try it. In my experience paleo banana breads work with flax eggs. Please let me know. Happy Baking! Hey Buddy!, I found this information for you: "PALEO BANANA GRANOLA BREAD". Here is the website link: https://www.vanessamusi.com/paleo-banana-granola-bread/. Thank you.